If you haven't been living under a rock lately then you have probably heard the term "The Internet of Things" getting thrown around to refer to non-computer items that are getting hooked up to the Internet. Conceptually this seems great, but it made me think about what items I can and what items I would even want to connect to the internet. That's when I remembered this little thing from Liftmaster. For about $30 this little box allows you to never have to turn your car around again to check if you left your garage door open. 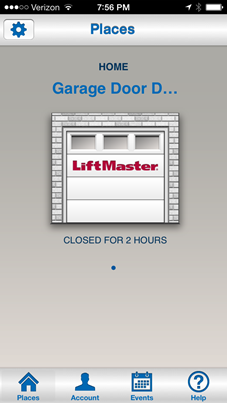 More specifically, it allows you to connect your newer Liftmaster garage door opener(s) to the Internet and then check the status of your garage door(s) from you IPhone or Android device. I had originally came across this when we first moved into our house, when I was looking up the garage door opener model that we had, but at the time Liftmaster wanted $1 a month for the service. Now they have made it free once you buy the device. Setup is pretty easy. It plugs into your network via a built in ethernet jack and then links up to your opener(s) via Liftmaster's MyQ technology. You need to make sure that your opener is compatible, but if it is then its a simple task to set it up. I downloaded the IPhone app and it easily walked me through the setup. The most annoying part was needing to pull out a ladder to press the button on my garage door opener in order to link the two devices. Once all is setup you can now check whether your garage door(s) are open or closed from anywhere with internet access along with opening and closing them. You can also setup alerts to notify you of various states, like if your garage door has been left open at night. Chamberlain, which is a sister brand of Liftmaster has what looks like the exact same product for that line of openers (the CIGBU) and based on the screenshots I have seen of the phone application and website it works exactly the same. I have been doing a bit of work lately analyzing images from both video streams and static pictures and apparently I have found the process interesting enough to write about it. It's not very often that I can get away from the standard CRUD type application and I really found it interesting to dig into the basics of image analysis. For the tasks I have been working on I've needed to get down to the individual pixels of an image. There are various ways to do this, some of them possibly easier than what I am going to be walking through, but due to the circumstances of what I needed to do this was then best method for me to accomplish it. First you need to get the jpeg into a BitmapImage object. It's a pretty simple task, especially if it is coming from a file. The most complex thing here is understanding what the stride is. Stride is the number of bytes in each row of the image. We basically take the number of pixels wide and multiple that by the number of bits per pixel which is a property off of the image. Since there are 8 bits in a byte we divide by 8 to get the number of bytes. The next key thing is the size of the byte array that we need which can be calculated by the PixelHeight multiplied by the stride. Finally we copy this into an array. We now have an array of bits that constitute the image. It's basically your standard for loop except we add 4 on each iteration of the loop. This is because we are looping though each pixel, but 1 pixel is represented by 4 bytes. Byte i is the blue channel, byte i + 1 is the green channel, byte i + 2 is the red channel, and finally byte i + 3 is the alpha channel. The table below represents the array for a 2 pixel wide by 8 pixel high image where each cell is a byte in the array and every four cells in 1 pixel. Hopefully this helps to visualize the layout of the data. Finally while in the loop you can set each byte to the proper RGB color values to manipulate the image how you want and then you convert the array back into an image using the below code. That's the basics of how to access the individual RGB values for each pixel in an image. It's pretty simple once you wrap you head around how each pixel relates to a byte.